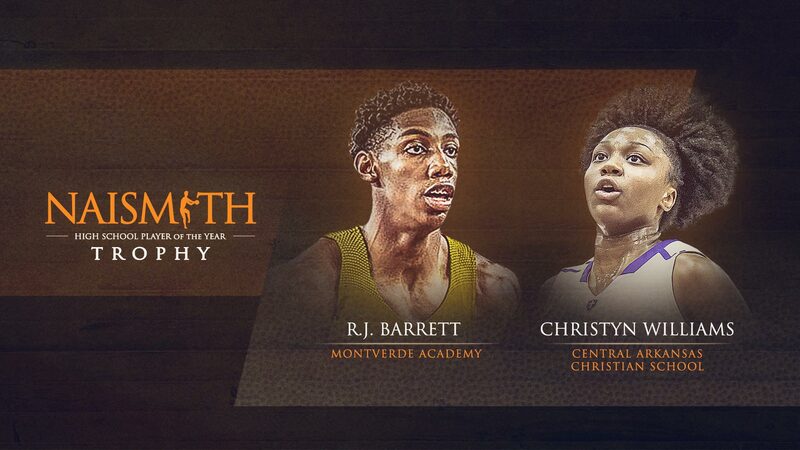 ATLANTA (March 9, 2018) – Today, the Atlanta Tipoff Club announced the winner of the 2018 Naismith High School Girls’ Player of the Year as Christyn Williams of Central Arkansas Christian School in Little Rock, Arkansas, and R.J. Barrett of Montverde Academy in Montverde, Florida, as the 2018 Naismith High School Boys’ Player of the Year. Williams is ranked the No. 1 female high school player in the country, and she has led her team to a 35-1 record with a 26-game winning streak. The Central Arkansas Christian School Mustangs will play in the Class 4A State Championships later today. Williams has averaged 26.4 points and 10.4 rebounds per game. She becomes the eighth Naismith High School Girls’ Player of the Year award winner to go on to play at UCONN and the second straight and third in the past four years to play with the Huskies. Earlier this week, the Atlanta Tipoff Club announced that Montverde coach Kevin Boyle was named the 2018 Naismith High School Coach of the Year award winner. This marks the third time ever that the Player of the Year and Coach of the Year have come from the same school. Previously, Satch Sullinger (COY) and Jared Sullinger (POY) from Northland High School in Columbus, Ohio won in 2010 while in 2016 Steve Baik (COY) and Lonzo Ball (POY) took home the awards to Chino Hill High School in Chino Hills, California. Barrett is also ranked the No. 1 player in boys’ high school basketball and is the second player from Montverde Academy to win the Player of the Year title in the past four seasons (Ben Simmons, 2015). Barrett’s team is 31-0 and hopes to continue its streak at the High School Basketball National Tournament in New York City later this month. He will be the third high school award winner to go on to play collegiately at Duke University, tying UCLA and Georgia Tech, following Shane Battier (Detroit Country Day, Beverly Hills, Michigan) in 1997 and Austin Rivers (Winter Park High School, Orlando, Florida) in 2011. The winners were selected by basketball journalists from around the country who form the Naismith Awards national high school board of selectors. The ballots were based on outstanding player performances during the 2017-18 high school basketball season. The Naismith High School Player of the Year award was first presented in 1987. Notable boys’ winners have included Jason Kidd (1992, St. Joseph Notre Dame High School, Alameda, California), Kobe Bryant (1996, Lower Merion High School, Ardmore, Pennsylvania), LeBron James (2003, St. Vincent-St. Mary, Akron, Ohio) and Derrick Favors (2009, South Atlanta High School, Atlanta). Notable girls’ winners have included Lisa Leslie (1990, Morningside High School, Inglewood, California), Chamique Holdsclaw (1995, Christ the King, Middle Village, New York), Candace Parker (2003, Naperville Central, Naperville, Illinois) and Maya Moore (2006 & 2007, Collins Hill High School, Suwanee, Georgia). For more information, visit www.naismithtrophy.com. Founded during the 1956-57 season, the Atlanta Tipoff Club is committed to promoting the game of basketball and recognizing the outstanding accomplishments of those who make the game so exciting. The Atlanta Tipoff Club administers the Naismith Awards, which have become the most prestigious national honors in all of college basketball. Named in honor of Dr. James Naismith, inventor of the game of basketball, the Naismith Trophy recognizes the top Men’s and Women’s College Basketball Players of the Year. Other Naismith Awards are presented to the Men’s and Women’s College Basketball Coaches of the Year, Boys’ and Girls’ High School Basketball Players and Coaches of the Year, Basketball Officials and Outstanding Contributors to the game. Celebrating its 50th year by honoring past winners, the Citizen Naismith Trophy was first presented to UCLA’s Lew Alcindor (later known as Kareem Abdul-Jabbar) in 1969. Old Dominion’s Anne Donovan won the inaugural Women’s Citizen Naismith Trophy in 1983.